Bullying is a hot topic issue in education. Students learn best when they are in an environment in which they feel safe. You can not feel safe if you are being bullied. 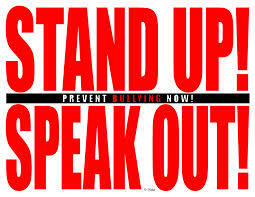 Therefore, it is a very high priority at RM Bacon Elementary School that we stop bullying in its tracks. All staff members have been trained in how to spot, report, and respond to bullying when we see it. The problem is bullies can be tricky and we don’t always see the behaviors. Students also need to be trained so that they have the confidence to stand up for others and report what they are seeing. We take bullying VERY seriously. When bullying is reported it is investigated by our HIB (harassment, intimidation, and bullying) team. This team consists of our guidance counselor, security guard, PBIS (positive behavior in schools) aide, and our principal. Often the investigation ends with a positive outcome. If the investigation proves that bullying exists, a plan of action is put into place including counseling, monitoring, and support for both the victim and bully. We will be working with the CAP (Child Abuse Prevention) Team this Friday and next Monday to learn about bullying. Students will learn about how to use their words wisely so as to not hurt others. They will also learn about different strategies to use when they feel that they are being treated unfairly. Here is a short music video that shows how bullying can impact a child and how having others stand up and speak out can change the direction of the bullying and give the child the confidence and support they need to stand up to the bully in an appropriate way. REMEMBER, BULLYING BACK IS NOT THE ANSWER!